This will be an album 100% handmade with the help of the collection "31 cours des 4 Jeudis" from the French brand 4heures37! You are going to learn how to create an asymmetric and creative structure in record time. Technically speaking, we are going to work on patterned backgrounds with inks, masks and stamps. You will learn how to let go of your creativity in this process! We will also try the embossing technique and use some metal material to give a masculine aspect to the album. 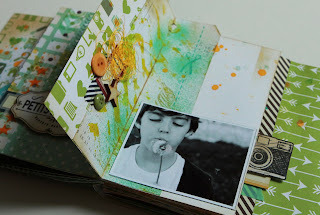 We'll add load of details to decorate your pages and pictures. That's the perfect album for your masculine pictures, or even your holidays, travels or outdoorsy pictures! Pictures: Either colour or black & white ones! I mixed both! Photos : en couleur ou noir et blanc ! Personnellement j'ai mixé les deux !